The Archie Horror line began with a zombie infestation of Riverdale in Afterlife With Archie, and since then, the imprint has expanded by fusing classic monster concepts with Archie character. 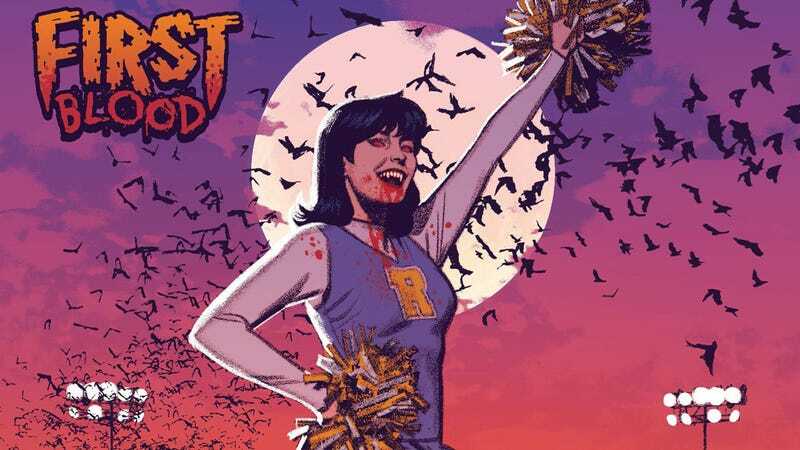 Jughead became a werewolf in Jughead: The Hunger, and the new series Vampironica turns Veronica Lodge into a deadly bloodsucker. Vampironica is the writing debut of Dream Thief and Moon Knight artist Greg Smallwood, and he’s partnering with his sister Meg as co-writer to lead Veronica into this terrifying new stage of her life. This exclusive preview of next week’s Vampironica #1 introduces readers to this new Veronica, who is channeling a lot of Buffy despite being one of the monsters she’s slaying. Greg’s artwork brings a lot of style, energy, and tension to these pages, and he’s does phenomenal work channeling the classic Archie spirit within a more modern visual aesthetic. Red and blue contrast heighten the intensity of this opening action sequence, and there’s a strong tonal shift when the story jumps back in time to Veronica’s carefree time as a human cheerleader.